“Shame on you!” Donna Charpied shouted after the board approved a landfill project called Eagle Mountain, billed as the answer to the San Gabriel Valley’s garbage crisis. Charpied literally had the last word then. I know. I was there. Our nation’s highest court rejected an appeal brought by Kaiser Ventures, principals of the project. Instead, the justices upheld a U.S. 9th Circuit Court of Appeals decision saying the landfill project’s environmental impact statement was flawed, did not consider alternatives and that the project would bring harm to the national park’s delicate ecosystem, including the endangered desert tortoise. It also threw out a key land exchange. It appears the Supreme Court’s ruling was the final nail in the coffin. Unless Kaiser Ventures goes back and authorizes another environmental impact statement and makes changes that mitigate the environmental concerns, this project seems dead. This hole in the ground 199 miles from Irwindale — a spent iron ore mill formerly used by Kaiser Steel to make raw materials for cars and skyscrapers — was supposed to be the resting spot for Los Angeles County’s household trash. I covered the hearings back then and witnessed the momentum building locally for a waste-by-rail project that began with the defeat of the giant garbage burners. I even flew in a small plane with Rep. David Dreier, R-San Dimas, and others to check out the place. I remember Dreier looking over the vast dug-out pits and saying this could really take all our trash for decades. The San Gabriel Valley Association of Cities, with the help of the Southern California Association of Governments, approved a plan to train trash to the desert. Many investors jumped on board. The idea was a good one. But, as it turns out, they had the wrong spot. The county Sanitation Districts, which is implementing the waste-by-rail plan, smartly moved its chess pieces to a landfill in Imperial County, the Mesquite Regional Landfill. This one has been permitted and is ready to accept trash from L.A. County via train, once the Puente Hills Landfill near Hacienda Heights closes on Oct. 31, 2013. As I moved into editing positions, we had a writer, Laurence Darmiento, who covered the topic. He would say that any giant landfill next to the beautiful desert park would never pass environmental muster. And he was right. What are the lessons of Eagle Mountain? First, don’t underestimate the public’s strong desire for preservation of our fragile lands and species. It’s something that’s ingrained in our culture, part of our love of open spaces. But aside from the coffee mug I have on my desk printed with the words “Eagle Mountain Landfill and Recycling Center,” what did we get from this effort? Eagle Mountain was a symbol that led to the closure of the Azusa Landfill, Spadra Landfill and the BKK Landfill in West Covina. It was seen as an alternative to close-in landfills near millions of residents. Though now you can replace the words “Eagle Mountain” with “Mesquite Landfill,” Eagle Mountain represented the Valley cities’ drive to remove the “Valley of the Dumps” sign formerly taped to our backs and begin a new era in trash management. That era began with aggressive recycling and will continue in November 2013 when trains leave filled with Valley trash for the Mesquite Landfill. “That could very well be a collector’s item,” said Shteir. Should California split in two? Sometimes it takes a really bad idea advocating radical change to make you appreciate the status quo, lousy though it may be. Such an idea is the proposal, which appears to be seriously made, by Riverside County Supervisor Jeff Stone for 13 counties to secede and form a new state of South California. No, not Southern California, the informal nomenclature for the seven counties south of the Tehachapis, somehow not including Santa Barbara, on the grounds that it’s too rich or too balmy, or something. But, again, Stone is an elected official, not a wild-eyed gadfly at public comment. He says he will present the notion to his colleagues at their Tuesday meeting. He’s frustrated about welfare and taxes and border security and whatnot. “He is so disenfranchised with the state’s inabilities,” Stone’s chief of staff told one media outlet, in a marvelous mangling of the mother tongue we speak in that Other California. didn’t – but it’s also the economic engine that drives the state. And yet Stone wants to leave us unturned, apparently because of his dislike of coastal liberals. Or something. In fact, an editorialist in Kern County, which would be included in the scheme to add a 51st star to the flag, has written that a better name for the proposed state would be “West Mississippi” – though we’re not sure what the folks in La Jolla and Balboa would think of that. We acknowledge that this proposal comes out of a frustration we very much share with politics as usual in the tarnished Golden State. We’re on board with his suggestion for a return to a part-time Legislature, seeing that the full-timers create more problems than they solve. But the creation of two Californias is not a new idea – it is older, in fact, than the current state of California itself. And it remains as seriously bad an idea as it was back in the 19th century, when pro-slavery advocates wanted the “cow counties” here in the south to enter the Union as an offshoot of old Dixie. There are small ways it’s bad: Americans like round numbers, and so there will likely never be a 51st state – sorry, Puerto Rico. And Doheny would likely start charging a longboard tax on visiting L.A. surfers, forcing Malibu to retaliate and Rincon to raise the ante. And there are very big ways: The University of California, the California State Universities and our community colleges are the hope for our economic future, together. Our great geographic and ethnic diversities are a strength, not a weakness. Our economy, the eighth-largest in the world, needs Californians to work together to strengthen it, not waste energy pulling it apart. In the 1970s and ’80s, Bay Area snobs would occasionally suggest splitting California in two, on account of simply not cottoning to the rubes down here. It was grist for the mill for a funny discussion – but was a very silly idea. This is just as flaky. California is one. AT the risk of offending some of my friends and co-workers who are bicycle enthusiasts: What’s with the 32-mile bike jaunts, the male riders wearing tight, lycra shorts and vacuum-sealed rubberized tops sporting eye-taxing colors that look like they were taken from an episode of “Sesame Street” from the ’70s? And what’s with the $5,000 bicycles (and that’s just the frames) that are such fine-tuned machines it takes someone more schooled than a BMW mechanic to work on them? These haute bicycles and their Lance Armstrong-esque riders dominate the San Gabriel River Bikeway on weekends at Puddingstone Lake, the rim of Santa Fe Dam, and the Rose Bowl loop like USC athletes do the Coliseum or professional drivers the brickyard. It’s all so intimidating. They might cause a weekend bicycler like myself, sporting tan cargo shorts and Sketchers, riding atop his “comfort bike” with fat tires, to stay on the living room couch instead. But it doesn’t have to be like that. I think average bicycler riders outnumber the elitists. Yeah, we can overcome … at 10 mph! It’s time we teach to the B and C students, instead of those already at the top of the bell curve. We are the troubled middle, in more ways than one. We have no choice but to hop on our beach cruisers or our rusty 10-speeds and hog the road. It’s time for the gut-spilling, middle-aged weekend pedalers to take their rightful place on the public bike paths of the San Gabriel Valley. We cede the larger and more popular San Gabriel River Bikeway to the guys in the sculpted aerodynamic helmets atop composite bicycle frames. And we dedicate the other bikeway along the east side of the region’s other river, the Rio Hondo River Bikeway, to us fatties. Never heard of the other river? It starts at a spent rock quarry turned park, Peck Road Water Conservation Park at the Arcadia-El Monte-Monrovia-Irwindale-Temple City border. Our group, Friends of Peck Park, wants to hold bike rides starting here, where this river bike path originates, and winds through El Monte’s newest parks — Lashbrook Park and Rio Vista Park — as well as oldy-but-goody Pioneer and Fletcher parks. We can enjoy a real river view at Bosque del Rio Hondo Park and loop using the Lario Trail, through Whittier Narrows and going north on the San Gabriel River bike trail. Then, if and when the county finishes the connection, traverse via bike path back to Peck Park. If this is too long (it’s at least 15 miles), we’ll need to create more short loops in the area called The Emerald Necklace. Amigos de los Rios President Claire Robinson calls these “Ts and Os.” No long, grueling bike marathons for us. Just a short “T” or “0” trip, thank you very much. Think of what having our own bike loops will do for weight loss, not to mention the fight against obesity, adult-onset diabetes and empty-nester boredom. 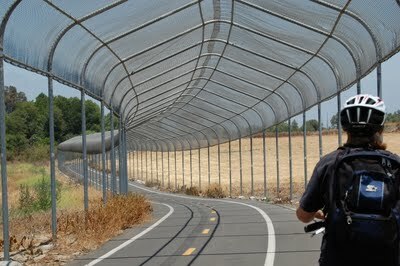 My wife Karen and I did some exploring a couple weekends ago and found the Rio Hondo River Bikeway. Its smooth surface features a covered S-curve structure designed to give you shelter from the sun, as well as those radio-controlled airplanes that buzz overhead. When you exit the covered structure, you ride a mile or so along a path edged by golden sunflowers, mustard and buckwheat. 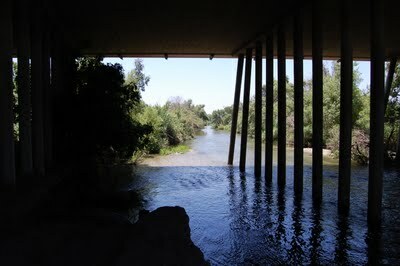 The Rio Hondo River, just to the west of the path, lies hidden. It appears suddenly like a monster from a thriller movie, providing a glimpse. Later, near El Monte, you can see where the river becomes a concrete channel, and you cry. One of the most environmentally ignorant projects ever built in the SGV — the concretization of the Rio Hondo. It was good while it lasted, you say. Then you spot Lashbrook Park on the right (thank you, Amigos de los Rios) and eye a bench half covered in shade from an elm tree. The spot is perfect for eating your peanut butter and honey sandwich that you wash down with a chug of water. Not a bad way to spend a Sunday afternoon. Are you ready to ride? Steve Scauzillo is opinion pages editor and co-founder of Friends of Peck Park. Next meeting is Saturday, Aug. 6..